Once again the Fairfield Bay Community Education Center will be offering a five-week oil painting class with Doris Sexson. The class will start on Thursday, August 21st from 9:30 to 11:30 a.m. The featured painting this session will be of a Hellebours Laten Rose with a Ruby Throated Hummingbird. The Hellebours Laten Rose is one of the most unusual of all garden flowers. In the painting the rose will be a very soft green color with white highlights and a touch of pink on the edges. 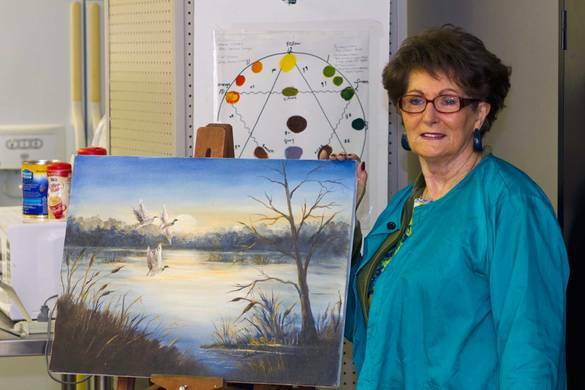 If you have not attended one of the oil painting classes with Doris, you will be surprised at how fun you will have and what skills you can learn. Some of the students taking part have not missed a class. They enjoy the experience so much that when one class ends they signed up immediately for the next class. You could become one of those artists.